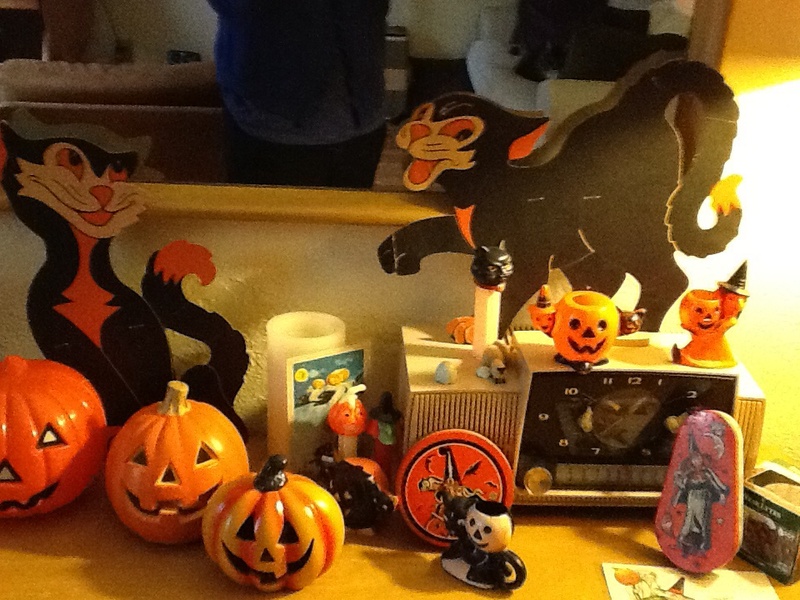 this is my little vintage halloween collection. I adore vintage halloween stuff , but it is very pricey. But it all fits in a small box and I don’t mind storing it. Samhain, is cross quarter in the Celtic year, way before all hollows eve, the christianized version. We’ll have a little fire in our fire pit tonight and drink some red wine! It’s a dex day so I’m on limited time till I crash. It’s so easy to forget how it is till you start again. This time I had 3 Saturday’s off. That’s longer than usual because my sister was here the week I would have started. But at least my ANC went up over 2000 so that was good. I’m going to do some flylady stuff ,catch up on laundry and try and pot a few flowers. I still need to budget out a few things too. Plus, we’re thinking of doing something non traditional for thanksgiviving . Over at ,http://thriftymominboise.blogspot.com, she’s making lasagna. We do lasagne at Christmas. Although last year we did a big bowl of spaghetti and meatballs and that was fun. But I think I’ll go back to the lasagna. Half meat, half vegie. Today is a beautiful fall day, but tomorrow we’re getting rain and the sierra snow. I’ll worry about my daughter driving to work in the snow, but she has all wheel drive. I’m still working on ideas for the room that was my daughters since my son moved to our studio. (which is a converted tuff shed by the way)! That was our homeschool room and later Sachi made it her graduate school study room. So now I’ve got two chairs out here but I feel it needs something else. I might move my desk out here, not sure. Well, off to the day! November budget and other miscellany! So, November is a little tight on the budget. With ynab, i was almost a month ahead ,now its more like 2 weeks. Most of it is the extra medical bills and Invisalign payments of $500. But with this check everythings covered till mid month. Also, we have property taxes due. I had wanted to start overpaying on the Santa Fe, but that will have to wait till December or even January. I know the medical will be done this month and my one cc that has the last Invisalign payment will be paid. After that the Invisalign will be more like $200 a month or less. It was the first $2000 they wanted fairly quickly. Also, christmas money will be available and the extra is our property taxes I put in there. It was a great way to budget it since you can’t withdraw from your Santa fund. i will definitely do that next year. B hopefully will get one more bonus this year but I don’t want to count on anything since his last one paid for the tree removal. It always seems money is needed for something and honestly its a little scary thinking of retirement. But I shall preserver as always. On to my doctors appointment. Geez, since I got the Pomalyst much later than I expected and just started yesterday , thats day 1. So the cycle is 21 days. that puts me at November 17 to finish and my appt. is November 18. So that is so not going to work as I won’t even had a blood test yet. So the complication is the following week is thanksgiving and the week after is too long away and my husbands out of town anyway. So, I did the best I could and my appt. is Wednesday, the day before Thanksgiving. And I need to have the Zometa IV. So, its kinda a drag as sometimes I never know how I will feel from the Zometa. But its the best of all scenarios. Anyway, Ive been busy washing the couch covers and switched the white for the tan for winter. Plus I did get thru a few magazines to give to the thrift store.Plus there’s a little pile of other stuff to go. Just went to get my blood test again to check my WBC so I can start pomalyst tomorrow or Wednesday. I called Optum RX and the prescription hadn’t been called in yet….huh.. So I had to call Mercy cancer center and get the nurse. So it should be faxed today. Geez…it’s a good thing I still can think. The budget for October was pretty blown in the way that we had such big expenses. But those were out of the EF for the roof and the trees. Food and non food(cat food, cleaning, wine etc..) came in @ $800. household ( like home depot etc) came in @ $300. So not too bad. Every thing else was normal or lower. Our electric has been great at @ $100. Thats low for us. The last medical from the bone marrow biopsy co pay is this month so, that’ll be done. Paying for my Invisalign will be ongoing for a year I’m guessing. I’m going to order propane and put that on my cc so I can get the points. I’ve already used points to get 5 gift cards for christmas. I finally got the outside windows done using Windexs outside sprayer. It’s a good product if you can’t afford someone to do your windows. B has been cleaning the yard up before we start getting the rains and its an ongoing process. Leaves, pine needles… on and on. But it looks good. We’re suppose to get rain Wednesday or Thursday. I might go walk another round in the park. I feel like I need to up my time walking to an hour total. But then I get lazy and don’t do it. We’re still walking in the morning buts only about 25 -30 minutes. I think I need to build up to an hour. I thought about a fit bit with the steps that you can see buti’m not sure I want to spend $125 for it. I’m visual so I’d need the one with the screen. we’ll see. Tahoe! Rain, and lab results!! Well, we’re home and had a very nice time in Tahoe. It’s amazing how the drought has affected tahoe. It is the lowest I’ve ever seen. I do hope El Niño brings us much needed rain. We spent too much on food. I had planned breakfast at the condo but we ate out. Ouch! How much can breakfast be for 4 adults. . . Too much. But the place is great. And we walked in the morning although not super early. Even today we weren’t out till 6:30. Pretty late . But the exciting news is it rained last night so every thing is nice and wet. Yeah!! My sister leaves tomorrow. Tonight we’re having spaghetti . Next week will be eat out of the freezer and I’m not planning on taking grocery money till I really need it. I did get back my labs and nothing great but nothing went up. M protein went down a tenth .8 ok, not great. My kappa light chains went down to 930 from 1140 so 200 points. So I’m grateful but it did that before and then the next cycle went back up. I think I want big results and I need to be ok with stable. I see him next week and I’m sure he’ll say stable, we will do another cycle. Someone posted on the myeloma Beacon about doing pomalyst with krypolis and getting great results. I don’t think he’ll do that. But I’m reassured that at least things are stable. I guess we all want big results and m proteins at .0 and kappa light chains in the normal range but alas it isn’t always so. today, I need to do some serious Flylady and then after Heidi leaves declutter and clean. The booksale went good and we made around $500. It’s not a lot but will help the library with our quarterly contributions to buy books. The raffle was a big success. I got wiped out but came home and took a nap. We went to the winery yesterday and the tastings were so so. Not well presented, but the lunch was stellar and the chef must be excellant. The food was. !! Today it’s quite warm , almost 90, so nice . We might go out for a dinner together, but my sisters stomach is bothering her so we’ll see. Auburn doesn’t have a lot of good restaurants and I think our best bet is Thai or Mexican. I’d be okay with a bowl of soup. Tomorrow she wants to go to sacramento but I think I’ll pass. To much going and I know I’ll feel it. I went for my blood test so we shall see what the numbers are. I made a batch of double stuffed potatoes to freeze. And did a little fly lady. So, I finished pomalyst the other night and now I’m just waiting to get my blood tests. Actually I went in this morning but my dr had put the date as on the 12 or after. We were going on my neutrophils were low so better to wait so I didn’t need to get jabbed twice. Well, I probably will have to anyway.but at least I’ll something by next week. It’s nice not to have to take a lot of pills. Right now it’s only acyclovir at night and my thyroid and BP in the am. I went to help set up for our annual friends of library book and bake sale tomorrow. Lots of good things and I hope it’s a good turn out. I cannot believe though they’re ( library admin, remember them who ” let me go”,are changing the branches hours. 8 to 12 or 1! It’s the kiss of death for the branch. Who’s going to come out at 8am. This is mostly a retired community. All they’re doing is accomadating the you know who, (branch manager) who should have taken the blame for getting me released from my job. It’s all about that she’s on permenant so it’s what works for her, not what’s best for the community. so, tonight my sister Heidi, arrives. I think it’ll be fun to see her and I’ll take her to the bake and book sale tommorow . Well, off to sit outside in this great weather.